This view of the ship is partly obscured by the large [17X4.5 meter] floating garden boat. But you can see the large size of her, and the big trees above, and the wide expanse of the Realengracht canal; luxuriously spacious yet still in the center of Amsterdam. This a premium location; a quiet, prosperous, and friendly neighborhood in the Centrum of Amsterdam, opposite PrinsenIsland. There is no through traffic on the street, and little water traffic compared to the inner ring canals. The south facing location gets direct sunlight, almost all day even in mid-winter. 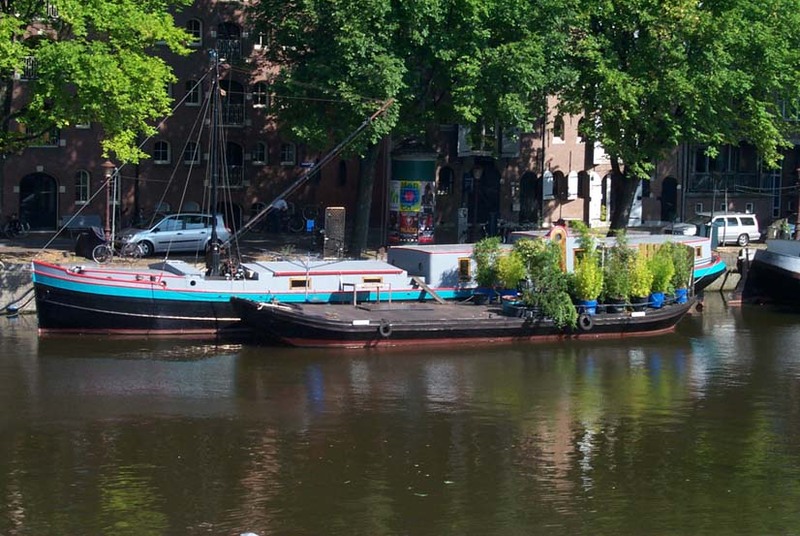 As well as the houseboat, you get the use of the garden, a Dutch "Dekshuit" or deck-vessel. It's a plain yet attractive steel pontoon, on which we have planted flowers and small trees in large pots; there is a lot of bamboo. It's featured in the coffee table book "Amsterdam from the water". It has an automatic watering system, so you don't have to worry about the plants. The boat is held about 4 meters away from the street, so there's a clean privacy moat, with a sturdy steel bridge with a locking gate. The boat is large, at 27 meters long. All of the boat is used as living space; there is no machine room any more. There is only 1 bedroom [for a couple] with a very large bed. There's a lot of storage space, a large living room, full bath and separate toilet, washing machine, high efficiency gas central heating, and hardwood double glazed windows that open. The interior is finished to a high standard, with hardwood floor throughout, white walls and dark hardwood trim. A large TV slides out of a fitted cupboard when you want to see it, and is hidden when you don't. Most of the interior is a single very spacious room, there is a separate space for laundry and storage, with 32 large built in drawers. The boat has city gas, water, and electricity. It is rented fully furnished. The kitchen has a new stove and oven. Excellent road access to the center of town and the ring highway. Good pubic transport links too.